Vegetable production involves many practices that compromise soil health, and therefore limit productivity. New York soils are less forgiving of such practices than soils in many other regions. Therefore, leading vegetable growers want to overcome this barrier to success with practices that maintain soil health. 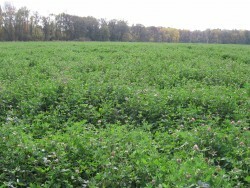 Some of the management goals for which farmers use cover crops include suppressing weeds, protecting soil from rain or runoff, improving soil aggregate stability, reducing surface crusting, adding active organic matter to soil, breaking hardpan, fixing nitrogen, scavenging soil nitrogen, and suppressing soil diseases and pests. This website enables growers to use a broader range of cover crops including grasses, legumes, crucifers and other kinds of cover crops. Cover crops are suggested for spring, summer, fall and over wintering. Go to the Cover Crops for Vegetable Growers website.